Soak in the calmness of Noku and let its laid-back, coastal charm take over you. 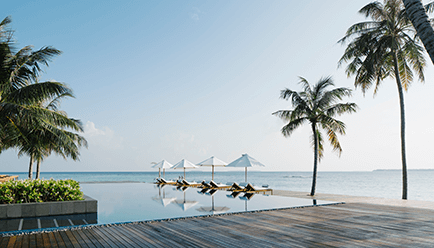 An epitome of opulence, Noku Maldives sits on the stunning Kuda Funafaru Island in Noonu Atoll. With its tastefully crafted design, this boutique resort compliments the blissful blue waters and pristine white sand that surround it. The Noku is an exquisite blend of comfort, space and tranquillity, a blend that will indulge even your most luxurious desires. 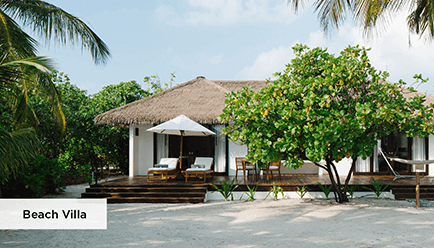 Featuring 50 modern private villas, Noku Maldives is an ultra-luxe property that offers discerning travellers an inimitable rendezvous with nature. 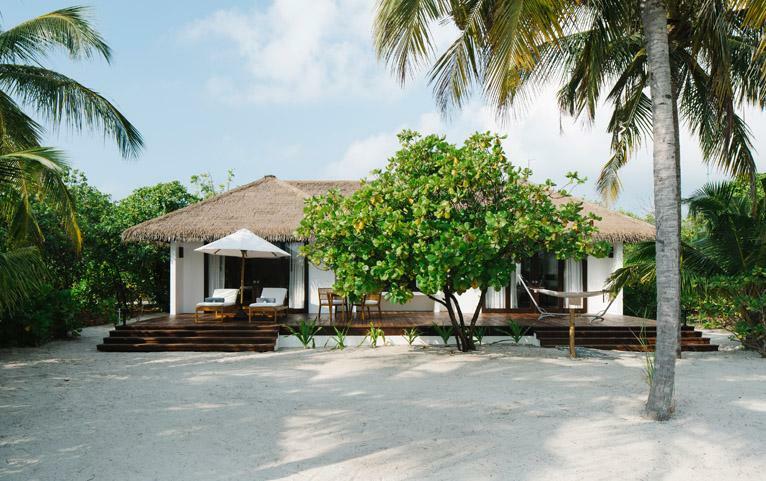 Whether you wish to admire the rich marine life of Kuda Funafaru, lounge by the crystal-clear waters or pamper your senses with a spa retreat, Noku shall enchant you with its exceptional hospitality. 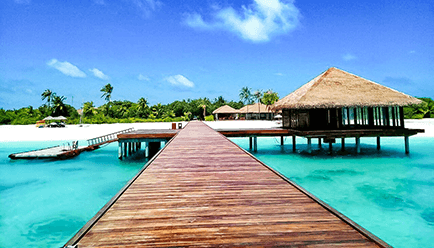 A treasure chest of nature’s most precious gems, the Maldives is a consolidation of 26 atolls that consist of more than 1000 islands. 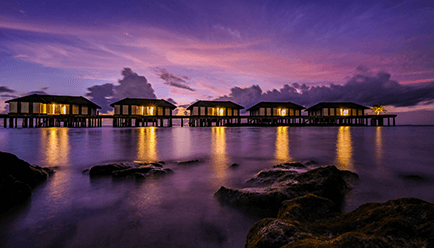 Well-known for its endless blue waters, coral reserves, white sand beaches and rich marine life the Maldives is the luxury traveller’s dream come true. 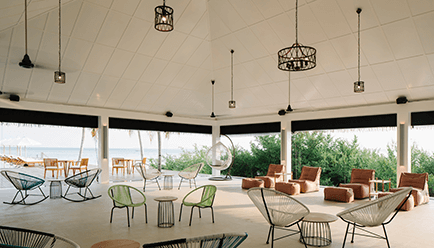 The Property – An intimate affair with nature! 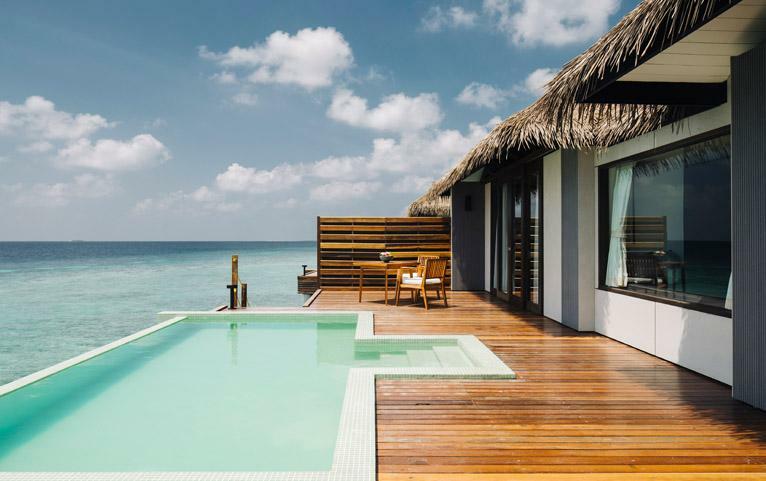 Surrounded by a crystal blue lagoon and lush greenery, the Noku houses 20 beach villas and 30 over-water villas. Each villa sits at a distance from others to ensure that guests can revel in their solitude bothered only by the sounds of soft waters. The villas are composed of modern interiors with dark wood accents, large bay windows and French doors that complement the vivid views the villas offer. These spacious villas facing the East provide a spectacular ocean view from the bay window and lavish sundeck attached to them. 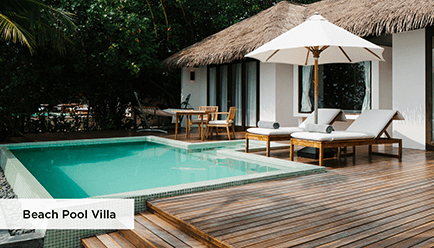 The white walls and dark wood interiors of these villas complement the understated and elegant theme of the resort. 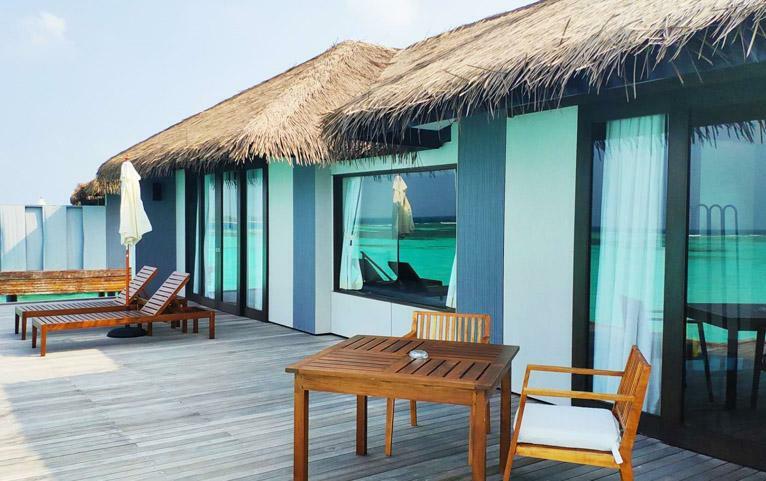 If living amidst the blue waters of the lagoon is what you fancy, the water villas at Noku are the place to be. Equipped with freestanding bathtubs and indoor as well as outdoor showers these spacious villas offer an inimitable view of the ocean. Beach Pool Villa 220 sq.m. 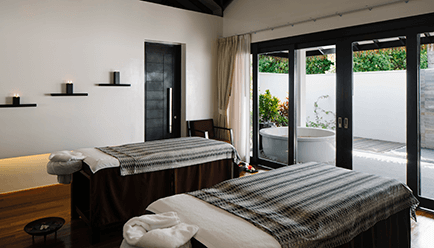 A dream-come-true for those who love to indulge in extensive cleansing rituals, these gorgeous villas come with freestanding bathtubs, outdoor rain showers, private plunge pools and indoor showers! 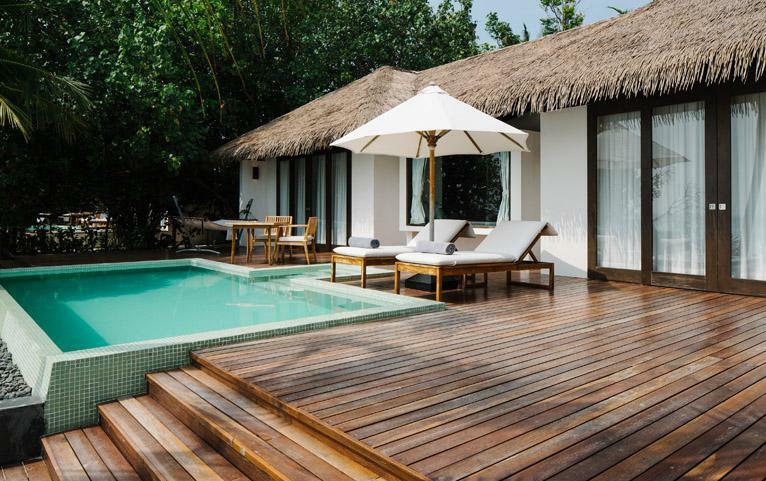 Equipped with generous sundecks, these villas offer a picturesque view of the white sand beach that lies beyond them. Water Pool Villa 190 sq.m. 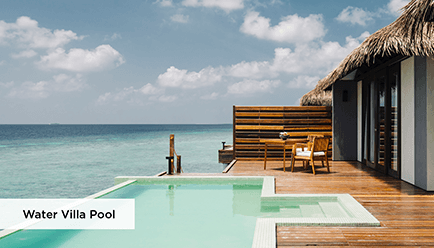 Away from the main island, these villas are perched right above the lagoon so you can take a luxurious dip into the blue waters whenever your heart pleases. Equipped with generous sun decks and infinity pools, these villas are dreamy and perfect for those who relish their privacy. Maximum Guest Capacity: The maximum room capacity is two adults and two children (aged below 12 years) or 3 adults. 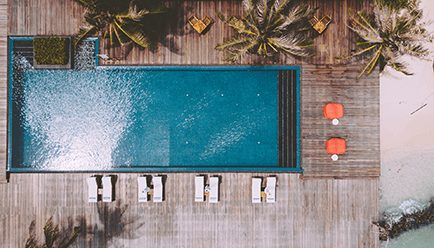 Extra Guest Policy: Where applicable, an extra adult can stay at a surcharge of US$ 370 per night + seaplane charges, with an extra bed and the inclusions available in the package, payable directly at the resort. Child Policy: Where applicable, a child aged below 2 years may stay at a surcharge of US$ 6 per night (green tax), a child aged between 2 - less than 6 years may stay at a surcharge of US$ 6 per night + seaplane charges, a child aged between 6 - 12 years may stay at a surcharge of US$185 per night + seaplane charges, these charges include an extra bed and the inclusions available in the package, payable directly to the resort. 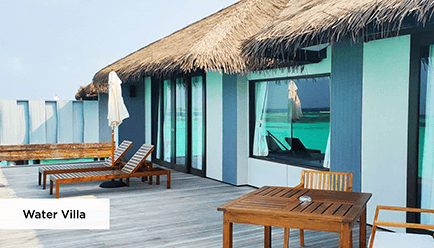 Transfer rates include return from Velana International Airport – Noku Maldives – Velana International Airport. Each passenger may carry 20 kgs of checked-in luggage and 5 kgs of hand luggage. For any excess luggage, the seaplane company charges US$ 4 per kg return. The carrier does not guarantee to transport luggage on the same flight as the passenger. Airport & Island Host: Wish to take a tour of the island with a local expert or want to be welcomed and assisted at the airport? Opt for Noku’s specialized airport and island host services. 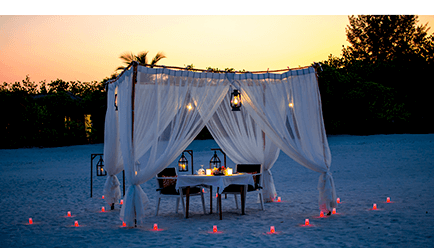 Private Dining: A romantic dinner with your beloved or an intimate family dinner by the beach, Noku shall arrange for you a meal to remember! The resort offers two dining options – the Palms Restaurant and the Thari Restaurant. 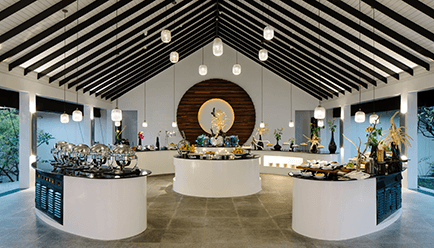 These restaurants offer a range of exotic Asian delights and a wide selection of International preparations for the gourmand in you. Bars: The Palms Bar and Thari Bar at the resort offer an assortment of signature and classic drinks. Whether you wish for a drink after a plunge in the pool or a swig of fine wine with your dinner, Noku’s collection of beverages is sure to leave you refreshed. Noku Spa: A unique blend of traditional Asian therapies and strong natural elements, the treatments at the Noku spa will stimulate your mind, body and soul. Diving and Water Sports Centre: Apart from some brilliant diving and snorkelling excursions, Noku provides a host of unparalleled water experiences like dolphin watching, jet ski, windsurfing, catamaran, sunset fishing. Other Facilities: Whether you wish to break a sweat at the gym, calm your senses at the Yoga pavilion, take a relaxing swim at the swimming pool or indulge in some retail therapy at the “Nice Things” Gift Shop, Noku’s amenities shall not leave you disappointed at all! 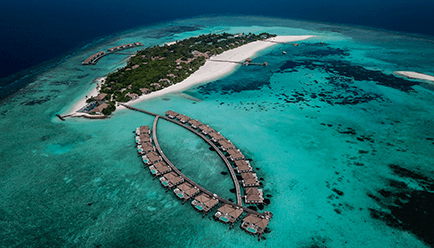 There are direct flights available to the Maldives from several cities in India (Mumbai, Bengaluru, Kochi, Chennai, Thiruvananthapuram). From other major cities in India, there are one-stop flights available to Malé International Airport. 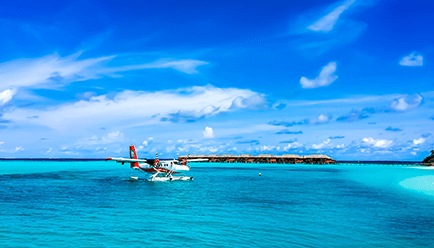 From the airport, Noku Maldives can be reached by a 45-minute seaplane.